The most tender and beautiful thing happened this week. 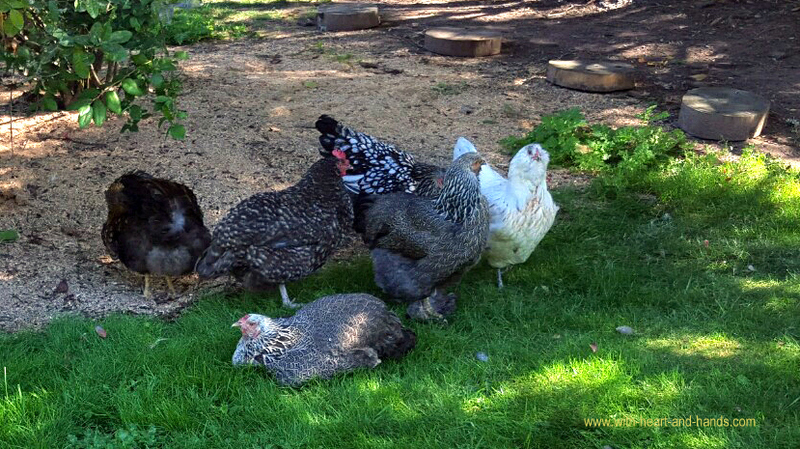 As our sweet Brahma chicken, Pia, began the process of dying, all of our other six chickens gathered around her and kept her company for many long periods over the course of her last two days of transition. I have heard of that happening in elephant families, but never in chickens...and it touched me deeply. People who don't understand how we can love chickens as pets, and enjoy their sweetness and their activities, don't understand what makes a simple creature into a beloved pet. And in a time, when life's challenges have stepped up the pace, when it seems like we are frantically busy dealing with the health and problems with extended family down here in Oregon, with our own little family and helping them through personal challenges and with increased challenges among my Alaskan family, putting life in perspective is crucial. As someone who is always working on, and always trying so hard to stay positive when stressors increase and multiple, to do what needs to be done without getting my own energies scattered or frantic, and still be loving and caring for others, it is such a grounding and such a centering to look at something like this and understand just what it stands for in so many ways. All week, my husband and I have been focused on heart and home and family. We have been working incredibly hard getting the yard and garden ready for winter and the house and our yard ready for a large family gathering this weekend as we celebrate the addition of someone very special into our family. But it has been such a busy time, pruning and weeding, building and restoring, putting up and taking down, making and baking and sewing into longer days and evenings. As the light begins to wane, as summer turned into autumn, the transitions of life have been significant and often even more challenging than usual. To me, all of life is meaningful. I see everything that happens to me, and around me, as signs and symbols to guide me, to give me signposts as to where I am on my own spiritual path, and on my life's purpose as well as its journey. Just watching this little scene play brought tears to my eyes and great love into my heart. Pia passed two days later. 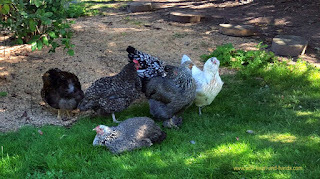 But before she passed, as one of our shyer chickens, I was amazed that she sought me out.....over and over and over. While she could still walk she would come up to me and just stand by me. And I would talk to her softly and stroke her feathers, I would tell her that I loved her and that I was so sorry that she was sick. When she could not longer walk, no longer stand, we carried her in and out of the coop into the shade so she could at least watch her companions and allow them to come and visit and support her. I would bring little shallow bowls of water, and simple, soft foods like rice and even if she could not eat, then at least she knew I cared. An this truly, is what my own journey is all about. In a few days time, as this precious vignette played out, Larry and I decided to travel to my childhood home in Alaska to support our extended family in crisis there. We will only be able to stay for a short while as we need to fly home again to support the challenges of our own little family, here in Salem, and the broader needs of my extended family members that came down to Oregon for their own health needs and support by family, earlier, as well. None of us has enough time, enough energy to do it all, but it is so much better to at least do what we can, when we can. We judge our immediate priorities and we choose just what and how we can do what at any given period. How lovely to be given this reminder in our own lives, and in the lives of the world, and religious leaders like the Holy Father, Pope Francis, who impact us with their messages in so many different ways. We are truly one family, and members of one world... and it so much better to unite than to feel and be separate. What a beautiful post! Thank you. What an incredibly beautiful post. Thank you for reaching into your heart and soul and sharing it with us. Have a safe trip. We'll be here when you get back. You are so amazing. It seems you go from one crisis to to the next and are always strong and stalwart. You chicken story is so sweet. Ah bless! You always write so beautifully Michelle. Indeed a beautiful post. You've done a lot of traveling and gathering around your loved ones as they face their trials and tribulations. I hope that they gather around you the same way.